Over $26,500 --- We Are MORE Than HALFWAY There! Thank you to those of you who already have donated to our GoFundMe campaign. So far we have raised $26,542 of our $50,000 goal, with online donations and checks! Ruth: "I get a lot of good book recommendations from this newsletter!" Nicole: “I love the website!" which releases on June 18th and will be a Bets On selection. are already a big hit! Click on the image of Carol above to see her second video. These socks, inspired by organ donor Taylor Storch to remind people of the importance of organ donation, have been made available on OutliveYourself.org during National Donate Life Month. and bought "floral meadow" bunny plates to help celebrate Easter. For Many, a Holiday Weekend! As I drove, I flipped around SiriusXM, realizing how many songs I know just by a few notes of an opening riff, and how many lyrics can go on rapid playback in my head. By the time I got home after midnight, I was hoarse from screaming lyrics, but energized enough to sit down on the couch and bang out this newsletter. I am betting no one else has shared loud singing as an unwind tip! Thank you for all the kind words about the newsletter preview video that I shared last week. I want to make this a regular thing. For the moment, we are planning to get them uploaded by Wednesday each week. You can see them on our Bookreporter Facebook page, as well as on our YouTube channel and our new Instagram page, thebookreportnetwork, which just launched this week. I am keeping these short and sweet just to tease what will be in the newsletter on a given Friday; also, we learned that Instagram limits videos to 60 seconds. I am noodling some ideas for other video and visual content. If there is something that you would like to see, drop me a note at Carol@bookreporter.com. Huge thanks to Nicole, our Advertising/Promotions Manager, for filming these and giving me great feedback on the presentation. By the way, Nicole is the person in the office who ensures that every contest goes live when it is supposed to and every promotion that we bring you has every detail covered. She never misses a beat! She is on vacation next week; her birthday is on Wednesday. If you would like to drop her some birthday wishes, her email is Nicole@bookreporter.com. I am definitely ready for spring to get sprung. The back seat of my car has every weight of coat and jacket, most in shades of teal, and I pluck what to wear according to the weather. I am so ready for anything with down to go back to the closet! 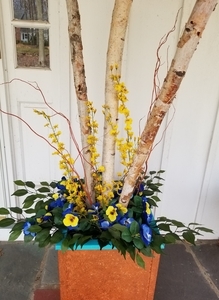 I realized last weekend that the greens, magnolias, pine cones and cotton bolls on the front porch arrangement needed to be retired, so I did some floral shopping and created the forsythia/pansy arrangement that you see above. No live flowers were involved in this display, but it still works for me. 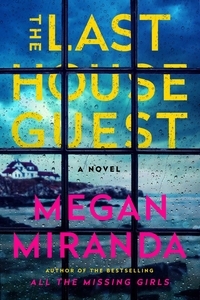 Last weekend, I plucked Megan Miranda’s THE LAST HOUSE GUEST from my book pile and found myself again marveling at what a strong writer Megan is. The plot, you ask? Avery Greer is the townie in a Maine beach town who befriends Sadie Loman, one of the wealthy girls who summers on the island. On the night of an end-of-the season party, Sadie is found dead on the beach, and all signs point to a suicide. But that does not make sense to Avery, who commits herself to figuring out what went awry. Megan is brilliant at plotting and turning the story in many different directions. There is an ”aha” of a twist at the end that I dare you to see coming. And this will be a Bookreporter.com Bets On selection when it releases on June 18th! 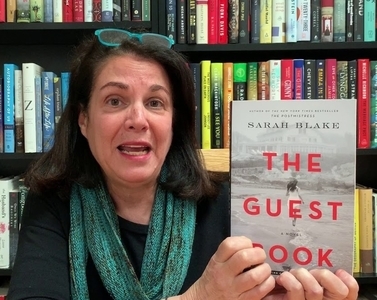 Sarah Blake, whose New York Times bestseller THE POSTMISTRESS was a Bets On pick when it released in 2010, makes a triumphant return with THE GUEST BOOK, which is our latest Fiction Author Spotlight title and will be a Bets On pick. While Kitty Milton and her husband, Ogden, summer on their island in Maine, anchored as they are to the way things have always been, the winds of change are beginning to stir. In 1959 New York City, two strangers enter the Miltons’ circle. One captures the attention of Kitty’s daughter, while the other makes each of them question what the family stands for. This new generation insists the times are changing. And in one night, everything does. So much so that in the present day, the third generation of Miltons doesn’t have enough money to keep the island in Maine. THE GUEST BOOK doesn’t release until May 7th, but we’re giving 35 readers the opportunity to win an advance copy and share their comments on it. To enter, please fill out this form by Thursday, May 2nd at noon ET. This is going to be one of the most talked-about books this summer. I read it, and once I closed it, I could not wait to talk about it with people. This is a novel that looks at class, culture and race in America framed against the purview of the Milton family. Don’t miss our review of the book and interview with Sarah in the May 10th newsletter, and my Bets On commentary the following week. 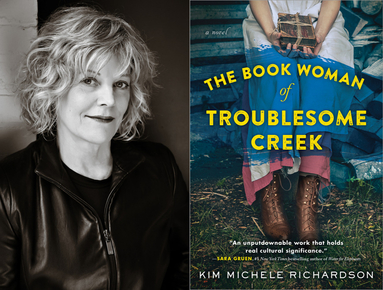 Our Women’s Fiction Author Spotlight shines this week on THE BOOK WOMAN OF TROUBLESOME CREEK by Kim Michele Richardson, which also releases on May 7th. Thanks to Roosevelt’s Kentucky Pack Horse Library Project, Troublesome Creek has its very own traveling librarian, Cussy Mary Carter. Far from being just a book woman, Cussy is also the last of her kind, her skin a shade of blue unlike most anyone else. Not everyone is keen on Cussy’s family or the Library Project, and a Blue is often blamed for any spot of trouble. If Cussy wants to bring the joy of books to the hill folks, she’s going to have to confront prejudice as old as the Appalachias and suspicion as deep as the holler. We’re awarding 50 copies of THE BOOK WOMAN OF TROUBLESOME CREEK to those who would like to read it and give us their feedback on it. To enter, please fill out this form by Thursday, May 2nd at noon ET. We’ll feature our review of the book and interview with Kim Michele in the May 10th newsletter. 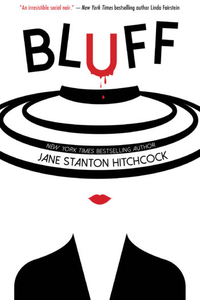 Our latest New Release Spotlight title is BLUFF, which marks Jane Stanton Hitchcock’s return to the world of crime fiction following a nine-year hiatus. One-time socialite Maud Warner bluffs her way into a signature New York restaurant. When she exits, a man will have been shot. Maud has grown accustomed to being underestimated and invisible, and she uses her ability to fly under the radar as she pursues celebrity accountant Burt Sklar, the man she believes stole her mother's fortune and left her family in ruins. Her fervent passion for poker has taught Maud that she can turn weakness into strength to take advantage of people who think they are taking advantage of her, and now she has dealt the first card in her high-stakes plan for revenge. We featured an interview with Jane a couple of weeks ago where she talked about her inspiration for the book and her own passion for poker. Click here to take a look at it. I picked up BLUFF this week, and it’s what I call snappy sharp. We have 16 reviews to share with you this week. 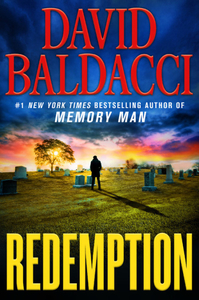 Among them are REDEMPTION, David Baldacci’s latest Memory Man thriller, in which Detective Amos Decker discovers that a mistake he made as a rookie detective may have led to deadly consequences; THE BETTER SISTER, a new psychological thriller from Alafair Burke, who warns her readers: Keep your enemies close and your sister closer (I picked this up during the week and am reading it now. I am reminded again what a sharp writer Alafair is); BEFORE SHE WAS FOUND by Heather Gudenkauf, a timely thriller about three young girlfriends, a dark obsession and a chilling crime that shakes up a quiet Iowa town (I read this a couple of weeks ago, and like Lisa Scottoline’s SOMEONE KNOWS, it had me thinking about the danger of secrets in the wrong hands); and SAVE ME THE PLUMS, Ruth Reichl’s memoir that chronicles her groundbreaking tenure as editor in chief of Gourmet (I recently made the audiobook a Bets On selection). 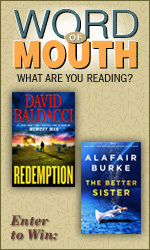 REDEMPTION and THE BETTER SISTER are our current Word of Mouth prizes. Let us know by Friday, April 26th at noon ET what books you’ve read for your chance to win both these thrillers. 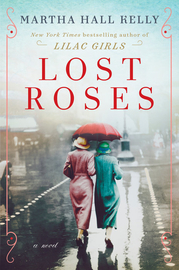 My two latest Bets On picks are LOST ROSES by Martha Hall Kelly (which we featured in last week’s newsletter) and THE GIRL HE USED TO KNOW by Tracey Garvis Graves (which we reviewed two weeks ago). Click on each of the titles for my Bets On commentary. In this week’s Spring Preview contests, we gave away ALL WE EVER WANTED by Emily Giffin (which releases in paperback on Tuesday) and ROAR by Cecelia Ahern (which we review this week). This year’s giveaways wrap up next week with our final three prizes: I KNOW WHO YOU ARE by Alice Feeney (I have this on my "to be read" pile), THE MOTHER-IN-LAW by Sally Hepworth, and THE SUMMER COTTAGE by Viola Shipman, the latter two of which will be Bets On picks. The first contest of the week will go live on Monday, April 22nd at noon ET. You can win the audio version of THE MOTHER-IN-LAW (read by Barrie Kreinik), along with D.J. 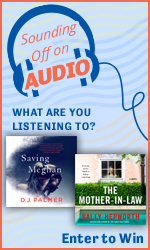 Palmer's SAVING MEGHAN (read by Mary Stuart Masterson and Rebecca Soler), in this month’s Sounding Off on Audio contest. Submit your comments about the audiobooks you’ve listened to by Wednesday, May 1st at noon ET, and you’ll be in the running to win both these audio titles. Don’t forget about our Mother’s Day contest! 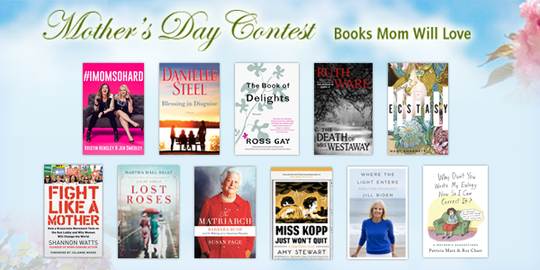 For the 14th year in a row, you can win an outstanding assortment of fiction and nonfiction titles for yourself or your mom. Five readers will be the proud recipients of all 11 of our prize books, which include BLESSING IN DISGUISE by Danielle Steel, THE MATRIARCH: Barbara Bush and the Making of an American Dynasty by Susan Page, and WHY DON'T YOU WRITE MY EULOGY NOW SO I CAN CORRECT IT? : A Mother's Suggestions by Patricia Marx and Roz Chast. To enter, please fill out this form by Wednesday, May 8th at noon ET. Our poll continues to ask which of 15 paperbacks releasing in April you have read or are planning to read. Let us know by clicking here. This week saw the announcement of the 103rd annual Pulitzer Prizes in Journalism, Letters, Drama and Music. Among the winners were THE OVERSTORY by Richard Powers (Fiction), AMITY AND PROSPERITY: One Family and the Fracturing of America by Eliza Griswold (General Nonfiction), and FREDERICK DOUGLASS: Prophet of Freedom, by David W. Blight (History). Click here for the complete list of winners and nominees in the Journalism, Letters, Drama and Music categories. The 39th annual Los Angeles Times Book Prizes were awarded last Friday night. The winners included THE GREAT BELIEVERS by Rebecca Makkai (Fiction), MY SISTER, THE SERIAL KILLER by Oyinkan Braithwaite (Mystery/Thriller), and THE LINE BECOMES A RIVER: Dispatches from the Border by Francisco Cantú (Current Interest). Click here for all the winners and nominees. Cheryl wrote, "I enjoyed reading your last newsletter where you mentioned the PBS series 'Mrs. Wilson.' It really was good! It is a true story adapted from the nonfiction book THE SECRET LIVES OF A SECRET AGENT by Tim Crook (seriously, that’s really the author’s name). After watching the series, I’m now planning to read the book! Didn’t know if you had read it before seeing the TV series. I really enjoy reading Bookreporter! Have a nice weekend!” I did not know this; thanks for the tip, Cheryl. Some of our best ideas come from our readers. Tania wrote, ”I enjoy reading the Favorite Monthly Lists & Picks column. I am only able to see the lists and picks for 2019. Is there a way that I can see columns from previous years? I conduct a monthly book club and like to browse these lists in order to help me select books for my ladies in book club. Also, I am trying to piece together a historical list of Target Book Club Picks.” This is a great idea, and this week we added these lists and picks going back to April 2014, when we started this feature. You can find the links to previous years on this page. Many thanks to Tom, our Editorial Director, for keeping these copious notes through the years! Outlive Yourself Socks: Longtime readers may know that I am on the advisory board of a nonprofit called Outlive Yourself. The socks that you see above were inspired by organ donor Taylor Storch (she would have been 23 today) to remind people of the importance of organ donation. It’s fitting that this item, which was developed in partnership with Nike, has been made available during National Donate Life Month. Woven into each and every sock are the threads of blue representing Taylor’s favorite color and blue eyes. Five rings on the socks signify the individual lives she saved. 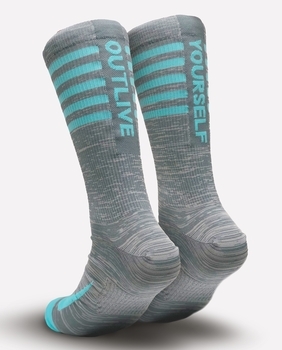 Proceeds from purchases of the Outlive Yourself Sock from www.OutliveYourself.org will benefit the Outlive Yourself Foundation and Donate Life America. Jeff Kinney: Author and Bookstore Owner: Here’s a terrific interview with Jeff Kinney, whose Diary of a Wimpy Kid series is a smashing success. Just out last week is a spinoff from this series, DIARY OF AN AWESOME FRIENDLY KID. Last weekend, I was at Costco and spied two children who were seated on a patio furniture display happily reading their copies of the book. Loved seeing this! "Game of Thrones" Observation: Season eight’s premiere kicked off with my taking a refresher course in all things Stark and Targaryen (by the way, there is spell-check for the latter). I asked lots of questions, but felt less lost than usual. I must note that when Daenerys (also spell-checked) and Jon Snow were flying on dragons, it felt like a Disney movie to me. All I could picture was him falling off and her swooping down to catch him. Waiting til she figures out he is her nephew; he already got the clue pill on this! "Bosch" is Back: The new season, its fifth, is now available on Amazon Prime Video. "Billions": Last Sunday night’s episode was so sharp. It was Axe at his most competitive. Brilliant writing. Tiger Woods: We ate pimento cheese as we watched Tiger’s amazing win. It was an ode to ”never give up.” I mean the game, not the pimento cheese; the latter was quite tasty. I still am surprised that CBS preempted their entire Sunday morning lineup for this round, but as my husband said, this IS the Masters. My parents, my niece Kelley, and Sam will be at dinner on Sunday. I am looking forward to cooking with Cory and Sam on Saturday afternoon. I have black jelly beans on hand for me and other colors for everyone else; no one else eats the black ones. Also, I found some egg-shaped Oreos with purple cream filling and some other decadent dark chocolates since most here only eat dark chocolate. After all, there has to be candy for Easter. I toyed with the idea of dying eggs, but the last time I did that, I managed to get dye on the chairs, the table and the floor. I am not a neat crafter and do not feel like doing a major cleanup! I got some bunny plates from Williams Sonoma to enhance the table setting. There are supposed to be four of each pattern in each box. Somehow I ended up with two of the same bunny in one box, which simply would not do! This is one hot item. I called the store near me to try to make an exchange, and they told me to come on over and they could make the exchange. 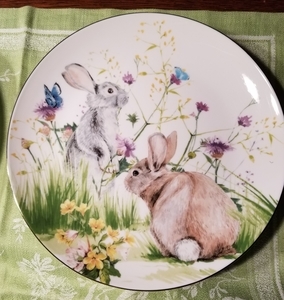 When I got there, I learned that there are “bunny plates” and there are “floral meadow plates,” and alas, what I was looking to replace were the latter, which they were out of. An amazing saleswoman in the store managed to track down a box of them in Pittsburgh with four different “floral meadow” bunnies, and handled the entire transaction for me as the store was closing. I love moments like this! You can see the “floral meadow” bunny plates above. To those who are celebrating Easter or Passover, we wish you Happy Holidays. Read on, and have a great week. Amos Decker and his FBI partner Alex Jamison are visiting his hometown of Burlington, Ohio, when he's approached by an unfamiliar man. But he instantly recognizes the man's name: Meryl Hawkins. He's the first person Decker ever arrested for murder back when he was a young detective. Though a dozen years in prison have left Hawkins unrecognizably aged and terminally ill, one thing hasn't changed: He maintains he never committed the murders. Could it be possible that Decker made a mistake all those years ago? As he starts digging into the old case, Decker finds a startling connection to a new crime that he may be able to prevent, if only he can put the pieces together quickly enough. Reviewed by Ray Palen. 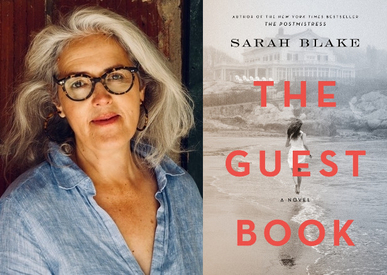 Moving through three generations and back and forth in time, THE GUEST BOOK is Sarah Blake's triumphant new novel that tells the story of a family and a country that buries its past in quiet, until the present calls forth a reckoning. We have 35 advance copies to give away to those who would like to read the book, which releases on May 7th, and share their comments on it. To enter, please fill out this form by Thursday, May 2nd at noon ET. - Click here to read Sarah Blake's bio. - Click here to visit Sarah Blake's website. Click here to read more in our Fiction Author Spotlight and enter the contest. A young outcast braves the hardships of Kentucky’s Great Depression and brings truly magical objects to her people --- books --- in THE BOOK WOMAN OF TROUBLESOME CREEK, Kim Michele Richardson's new novel inspired by the brave women of the Pack Horse Library Project. We have 50 copies to give away to those who would like to read the book, which releases on May 7th, and share their comments on it. To enter, please fill out this form by Thursday, May 2nd at noon ET. The hardscrabble folks of Troublesome Creek have to scrap for everything --- everything except books, that is. Thanks to Roosevelt’s Kentucky Pack Horse Library Project, Troublesome has its very own traveling librarian, Cussy Mary Carter. Cussy's not only a book woman, however; she’s also the last of her kind, her skin a shade of blue unlike most anyone else. Not everyone is keen on Cussy’s family or the Library Project, and a Blue is often blamed for any whiff of trouble. If Cussy wants to bring the joy of books to the hill folks, she’s going to have to confront prejudice as old as the Appalachias and suspicion as deep as the holler. - Click here to read Kim Michele Richardson's bio. - Click here to visit Kim Michele Richardson's website. - Connect with Kim Michele Richardson on Facebook and Twitter. Though Chloe was the younger of the two Taylor sisters, she always seemed to be the one in charge. She was the honor roll student with big dreams and an even bigger work ethic. Nicky --- always restless and more than a little reckless --- was the opposite of her ambitious little sister. For a while, it seemed that both sisters had found happiness. But now, more than 15 years later, their lives are drastically different. When Chloe’s husband, Adam (who used to be married to Nicky), is murdered by an intruder, Chloe reluctantly allows her teenage stepson’s biological mother, Nicky, back into her life. 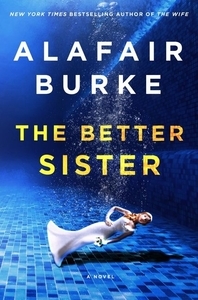 But when the police begin to treat Ethan as a suspect in his father’s death, the two sisters are forced to confront the truth behind family secrets they have tried to bury in the past. Reviewed by Roz Shea. For 12-year-old Cora Landry and her friends Violet and Jordyn, it was supposed to be an ordinary sleepover --- movies and Ouija and talking about boys. But when they decide to sneak out to go to the abandoned rail yard on the outskirts of town, little do they know that their innocent games will have dangerous consequences. Later that night, Cora is discovered on the tracks, bloody and clinging to life, her friends nowhere to be found. Soon their small rural town is thrust into a maelstrom. Who would want to hurt a young girl like Cora --- and why? In an investigation that leaves no stone unturned, everyone is a suspect and no one can be trusted --- not even those closest to Cora. Reviewed by Megan Elliott. - Click here to read Jane Stanton Hitchcock's bio. - Click here to read an interview with Jane Stanton Hitchcock. - Click here to visit Jane Stanton Hitchcock's website. - Connect with Jane Stanton Hitchcock on Facebook, Twitter and Instagram. Once again, the story is told through the voices of three female characters, this time set during World War I. The book opens in the United States in 1914 before moving to Russia and then to Paris. Caroline makes a few brief cameos, but this story is Eliza’s to share. Besides Eliza, her friend Sofya Streshnayva, who is a cousin of the Romanovs, and Varinka, who is a kitchen worker, are the characters, each lending a perspective that moves the story forward. - Click here to read our interview with Martha Hall Kelly. Click here to read more of Carol's commentary on LOST ROSES. They meet at college playing chess back in 1991 at the University of Illinois at Urbana-Champaign. While readers may recognize it now, Annika is somewhere on the autism spectrum, which few were talking about back then. She is very set in her ways. Labels bother her. Tight clothes are an issue. So are loud noises. But when she focuses, she is laser clear, which is what she is when she plays chess. Jonathan finds her to be a worthy opponent and encourages her to attend a chess tournament, which is way outside her comfort zone. He and her roommate Janice are champions of Annika’s loving, quiet nature and gentle ways. Both help her navigate the things in life that many of us just roll with. 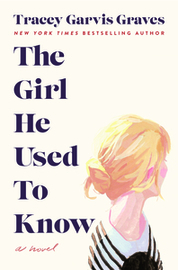 THE GIRL HE USED TO KNOW. Our next prize book will be announced on Monday, April 22nd at noon ET. When Condé Nast offered Ruth Reichl the top position at America’s oldest epicurean magazine, she declined. She was a writer, not a manager, and had no inclination to be anyone’s boss. 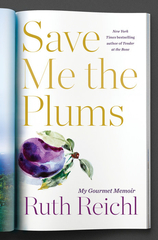 But Reichl had been reading Gourmet since she was eight; it had inspired her career. How could she say no? This is the story of a former Berkeley hippie entering the corporate world and worrying about losing her soul. It is the story of the moment restaurants became an important part of popular culture, a time when the rise of the farm-to-table movement changed, forever, the way we eat. Reviewed by Rebecca Kilberg. - Click here to read Carol’s Bookreporter.com Bets On commentary on the audiobook. At school, Connell and Marianne pretend not to know each other. He is popular and well-adjusted, star of the school football team, while she is lonely, proud and intensely private. 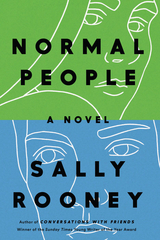 But when Connell comes to pick his mother up from her job at Marianne’s house, a strange and indelible connection grows between the two teenagers --- one they are determined to conceal. A year later, they’re both studying at Trinity College in Dublin. Marianne has found her feet in a new social world, while Connell hangs at the sidelines, shy and uncertain. As she veers into self-destruction and he begins to search for meaning elsewhere, each must confront how far they are willing to go to save the other. Reviewed by Sarah Rachel Egelman. As the creator of "Cathy," Cathy Guisewite found her way into the hearts of readers more than 40 years ago, and has been there ever since. Her hilarious and deeply relatable look at the challenges of womanhood in a changing world became a cultural touchstone for women everywhere. 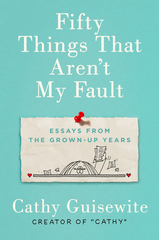 Now Guisewite returns with her signature wit and warmth in this debut essay collection about another time of big transition, when everything starts changing and disappearing without permission: aging parents, aging children, aging self stuck in the middle. Reviewed by Cindy Burnett. Psychiatrist Randall Beck specializes in PTSD cases --- and his time is limited. Especially when he uncovers a plot to kill a presidential candidate. Molly Rourke's son has been murdered --- and she knows who's responsible. Now she's taking the law into her own hands. He can kill anybody in just minutes --- from the first approach to the clean escape. His skills have served him well, and he has a grand plan: to get out alive and spend his earnings with his beloved wife, Maria. An anonymous client offers Ryan a rich payout to assassinate a target in Harvard Yard. The precision strike starts perfectly, then somehow explodes into a horrifying spectacle. Ryan has to run and Maria goes missing. Now the world's fastest hit man sets out for one last score: Revenge. And every minute counts. Reviewed by Joe Hartlaub. Daniel Pitt, along with his parents, Charlotte and Thomas, is delighted that his sister, Jemima, and her family have returned to London from the States for a visit. But the Pitts soon learn of a harrowing incident: In Washington, D.C., one of Jemima’s good friends has been assaulted and her treasured necklace stolen. The perpetrator appears to be a man named Philip Sidney, a British diplomat stationed in America’s capital who, in a cowardly move, has fled to London, claiming diplomatic immunity. But that claim doesn’t cover his other crimes. When Sidney winds up in court on a separate charge of embezzlement, it falls to Daniel to defend him. Reviewed by Ray Palen. In our youth-obsessed culture, we’re bombarded by media images and messages about the despairs and declines of our later years. Beauty and pharmaceutical companies work overtime to convince people to purchase products that will retain their youthful appearance and vitality. Wrinkles are embarrassing. Gray hair should be colored and bald heads covered with implants. Older minds and bodies are too frail to keep up with the pace of the modern working world. Ashton Applewhite once held these beliefs too until she realized where this prejudice comes from and the damage it does. THIS CHAIR ROCKS traces her journey from apprehensive boomer to pro-aging radical, and in the process debunks myth after myth about late life. Reviewed by Pauline Finch. Soldier, son, lover, husband, breadwinner and churchgoer, Henry Maxwell has spent his whole life trying to live with honor. A native Pittsburgher and engineer, he's always believed in logic, sacrifice and hard work. Now, 75 and retired, he feels the world has passed him by. It's 1998, the American century is ending, and nothing is simple anymore. His children are distant, their unhappiness a mystery. Only his wife Emily and dog Rufus stand by him. 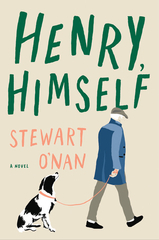 Once so confident, as Henry's strength and memory desert him, he weighs his dreams against his regrets and is left with questions he can't answer: Is he a good man? Has he done right by the people he loves? And with time running out, what, realistically, can he hope for? Reviewed by Harvey Freedenberg. In ROAR, Cecelia Ahern explores the endless ways in which women blaze through adversity with wit, resourcefulness and compassion. She takes the familiar aspects of women's lives --- the routines, the embarrassments, the desires --- and elevates these moments to the outlandish and hilarious with her astute blend of magical realism and social insight. One woman is tortured by sinister bite marks that appear on her skin; another is swallowed up by the floor during a mortifying presentation; yet another resolves to return and exchange her boring husband at the store where she originally acquired him. The women at the center of this curious universe learn that their reality is shaped not only by how others perceive them, but also by how they perceive the power within themselves. Reviewed by Rachel McConnell. Delighted by a surprise invitation, Miriam Macy sails off to a luxurious private island off the coast of Mexico with six other strangers. Surrounded by miles of open water in the gloriously green Sea of Cortez, Miriam is soon shocked to discover that she and the rest of her companions have been brought to the remote island under false pretenses --- and all seven strangers harbor a secret. Danger lurks in the lush forest and in the halls and bedrooms of the lonely mansion. Sporadic cell-phone coverage and miles of ocean keep the group trapped in paradise. And strange accidents stir suspicions, as one by one, they all fall down. Reviewed by Pamela Kramer. June Bloom is a broke, cynical 29-year-old writers’ assistant on the late-night comedy show, “Stay Up with Hugo Best.” Hugo Best is in his 60s, a beloved icon of TV and humor, and a notorious womanizer. 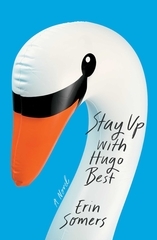 After he unexpectedly retires and a party is held for his now-unemployed staff, Hugo asks June to come to his mansion in Greenwich for the long Memorial Day weekend. The exact terms of the visit are never spelled out, but June is realistic and clear-eyed enough to guess. Even so, as the weekend unfolds and the enigmatic Hugo gradually reveals himself, their dynamic proves to be much more complicated and less predictable than she expected. Reviewed by Norah Piehl. Called "one of the most significant organized crime figures in the United States" by the U.S. District Attorney, Vincent "Jimmy Blue Eyes" Alo was just 15 years old when Prohibition became law. Over the next decade, Alo would work side by side with Lucky Luciano and Meyer Lansky as they navigated the brutal underworld of bootlegging, thievery and murder. Introduced to the 91-year-old Alo living in retirement in Florida, Dylan Struzan based A BLOODY BUSINESS on more than 50 hours of recorded testimony --- stories Alo had never shared, and that he forbid her to publish until "after I'm gone." Alo died, peacefully, two months short of his 97th birthday. And now his stories --- bracing and violent, full of intrigue and betrayal, hunger and hubris --- can finally be told. Reviewed by Joe Hartlaub. Jon thought he had all the time in the world to respond to his wife’s text message: I miss you so much. I feel bad about how we left it. Love you. But as he’s waiting in the lobby of his hotel in Switzerland, he receives a string of horrifying push notifications. Washington, DC has been hit with a nuclear bomb, followed by New York, London and finally Berlin. Now, two months later, there are 20 survivors holed up at the hotel. 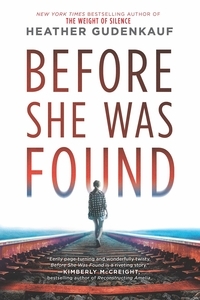 When the body of a young girl is discovered, Jon becomes obsessed with investigating her death as a way to cling to his own humanity. Yet the real question remains: Can he afford to lose his mind in this hotel, or should he take his chances in the outside world? Reviewed by Abby Jackson. In the years after Christ's crucifixion, Paul of Tarsus, a prosperous tentmaker and Jewish scholar, took it upon himself to persecute the small groups of his followers that sprung up. But on the road to Damascus, he had some sort of blinding vision, a profound conversion experience that transformed Paul into the most effective and influential messenger Christianity has ever had. In THE DAMASCUS ROAD, novelist Jay Parini brings this fascinating and ever-controversial figure to full human life, capturing his visionary passions and vast contradictions. Reviewed by Bianca Ambrosio. Below are some notable titles releasing on April 23rd that we would like to make you aware of. We will have more on many of these books in the weeks to come. For a list of additional hardcovers and paperbacks available the week of April 22nd, see our “On Sale This Week” newsletter here. CHASING COSBY is the definitive account of Bill Cosby's transition from revered father figure to convicted criminal, told by a veteran crime reporter and former senior writer for People magazine. Told in the alternating voices of Mary Todd and Joshua Speed, and inspired by historical events, COURTING MR. LINCOLN creates a sympathetic and complex portrait of Mary unlike any that has come before, as well as a moving portrayal of the deep and very real connection between the two men. From the bestselling author of GRATITUDE and ON THE MOVE comes a final volume of essays that showcase Oliver Sacks' broad range of interests --- from his passion for ferns, swimming and horsetails, to his final case histories exploring schizophrenia, dementia and Alzheimer's. When actress Aimee Sinclair comes home and discovers her husband is missing, she doesn’t seem to know what to do or how to act. The police think she’s hiding something, and they’re right, she is --- but perhaps not what they thought. Aimee has a secret she’s never shared, and yet she suspects that someone knows. Charlie, who is drifting through life and dodging full-time employment, is in love with Miranda, a bright student who lives with a terrible secret. When Charlie comes into money, he buys Adam, one of the first synthetic humans, and designs his personality. It isn't long before a love triangle forms, and these three beings confront a profound moral dilemma. This debut from Melinda Gates, co-chair of the Bill and Melinda Gates Foundation, is a timely and necessary call to action for women's empowerment. THE MOTHER-IN-LAW is a twisty, compelling new novel about one woman's complicated relationship with her mother-in-law that ends in death. Before blogs even existed, Anna Quindlen became a go-to writer on the joys and challenges of family, motherhood and modern life in her nationally syndicated column. Now she’s taking the next step and going full nana in the pages of this lively, beautiful and moving book about being a grandmother. Lucas Davenport is on the trail of a serial killer who has been operating for years without notice. His quarry is ruthless, and --- as Davenport will come to find --- full of surprises. 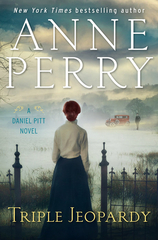 Unlikely pairs join forces to crack a slew of intriguing cases in an anthology edited by New York Times bestselling author Anne Perry, featuring original stories by Jacqueline Winspear, Jeffery Deaver, Allison Brennan, Charles Todd and many more, including Perry herself. Tough-as-nails Texas Ranger Caitlin Strong returns in this electrifying 10th installment of the series, by USA Today bestselling author Jon Land. Don't forget to forward this newsletter to a friend or to visit the websites in TheBookReportNetwork.com: Bookreporter.com, 20SomethingReads.com, ReadingGroupGuides.com, GraphicNovelReporter.com, Teenreads.com, Kidsreads.com and AuthorsOnTheWeb.com. Was this email forwarded to you? Then subscribe here. And be sure to connect with us on Facebook, Twitter, Instagram and Pinterest.